I started blogging about 8 months ago and after a few experiments I created Bookish Findings in June 2013. When I started blogging I had two main goals: to improve my English (I’m a Portuguese girl living in sunny Portugal) and to meet other bookaholics like me. So, definitively one of my favorite parts of book blogging is meeting other book bloggers who have the same taste in books, but also to discover amazing new books to read. I must confess I love the classics, but I also blog about YA, horror, and whatever I feel like reading at that moment (and as you may have noticed I blog a lot about literary gifts and other bookish stuff I discover on the web). That’s a difficult question. But if I had to choose just one book I would go with Death with Interruptions by José Saramago, a Portuguese writer who won the Literature Nobel a few years ago. This amazing novel poses the question of what would happen if from now on nobody ever died. Definitively meeting other bookaholics like me who share the same passion for books. I'd have to say that Fangirl by Rainbow Rowell was my favorite - along with nearly everyone else's. A very well written book although so hard hitting that it's not always super fun to read. I also loved Clockwork Princess by Cassandra Clare, Diana Peterfreund's books, All Our Yesterdays by Cristin Terrill, among many others. I posted a list of my Top Ten Books earlier this week. If you're interested, I also posted a list of my Favorite Albums and Songs of 2013. The Linky List was down when I went to publish this at 9pm - if it comes back up great. Use it. But I wasn't taking my chances -- this is why there will be two linky lists on the posts. The Simply Linked is the back-up list. When the linkytools list becomes active again, please use that one. But, continue to click the blogs that used the SimplyLinked list. I've heard great things about Rainbow Rowell, though I haven't read her. Maybe this coming year. :D I started the Mortal Instruments series this year and am loving it, though I haven't gotten to Clockwork Princess series yet. Great picks! Happy Friday! I have a huge list for 2013 haha. I have trouble being decisive about this kind of stuff! Oh, I plan on reading Rainbow Rowell's books this year, Alison! Cassandra Clare featured on my list too, along with quite a few others. Happy first Friday for 2014. Fangirl made my list too! I'm not a new follower but I have been out of the blogging world for almost a year. Good to be back and glad to be apart FFF again! I haven't read a Rainbow Rowell book, but I've hear AMAZING things about her novels. I haven't read any Rainbow Rowell books and the Clockwork Princess by Cassandra Clare. SOON! Yep, Fangirl's in my list as well. Just a beautiful and wonderfully written story. Thanks for sharing. I have been wanting to read Fangirl. :} Thank you for sharing. Been seeing a lot of her around lately. Don't think her books are my taste, but glad to see everyone enjoying them! I loved Clockwork Princess. Have a great week. Fangirl is on my list too! I read For Darkness Shows the Stars in 2012 and it was amazing. I'm read Across a Star-Swept Sea right now and loving it. Old follower. I've heard Fangirl is really good! maybe I'll be going to the library soon to check it out (: Great top ten list as well! Hmm, one of my face books was The Fault In Our Stars, Deceptions and there are probably more that I can't name right now. Happy Friday!! I'm a new follower, please have a look at my blog. I have Fangirl, and I still haven't read it yet. It's on my list to read to read soon though. :) I have enjoyed meeting other bloggers since I started blogging and finding genres that I normally wouldn't have read. Have a great weekend. Heard of Fangirl, haven't read it though! I really want to read 'All Our Yesterdays'! Hey! I am new t the blog hop! :) Clockwork Princess was one of my favourite books of the year too! :) It was beautiful and the ending was perfect! I haven't read her yet, but I'm definitely intrigued now. I loved Clockwork Princess. Such a fantastic series! Happy Friday! 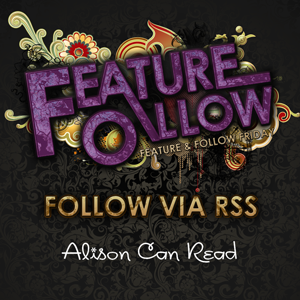 I just want to thank you for choosing my blog for the FF Feature. This is a great blog hop!